THE price of mealie-meal is expected to stabilise in Zambia due to the anticipated bumper maize harvest in the 2013/14 farming season. According to the Millers Association of Zambia (MAZ), the availability of additional maize stocks from the expected bumper harvest, will help to cushion possible grain shortages that will translate into reduced mealie-meal prices. 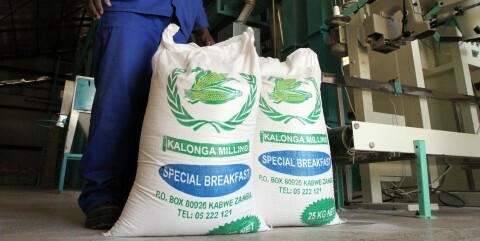 MAZ president Allan Sakala said the bumper harvest had come as a relief to millers because it will be readily available. Zambia is expected to produce 3,350,671 tonnes of maize this year exceeding last year’s production of 2,532,800 tonnes. Mr Sakala, however, said despite economic challenges such as the increase in the price of petroleum, millers will not udjust upwards prices of the commodity. “Prices are expected to remain stable and there will be no upward adjustments just yet because the cost of production is still within manageable margins” Mr Sakala said. Mealie-meal has been fetching as much as K90 per 25 kilogramme bag in some parts of Zambia. Mr Sakala said the authorisation of maize exports to neighbouring countries will promote trade and maintain Zambia’s status as the regional food hub. Meanwhile, Agriculture and Livestock Minister Wylbur Simuusa has said the Government will dedicate enough funds towards securing maize storage facilities this year. Mr Simuusa said the Treasury had released K20 million to the Ministry of Agriculture for maize purchases and Government intends to buy 500,000 tonnes of the grain predominantly from small-scale farmers. “We want to make sure that there are enough maize shelters to accommodate the grain which will be in excess of 500,000 tonnes mostly from the small-scale farmers,” he said. Previous articleKNPD to set up a survival skills centre for the disabled. What bumper harvest are you talking about? Ask the agriculture camp officers if what has been anticpated is true?